Mongolian Armed Forces troops at Khaan Quest 2013. For the first time, China is sending People’s Liberation Army troops to exercise Khaan Quest. For the first time ever, China has sent People’s Liberation Army troops to Exercise Khaan Quest, a multinational ground forces peacekeeping drill designed to boost military-to-military interoperability, hosted by Mongolia. The exercise is cosponsored with the United States Pacific Command (PACOM). Khaan Quest was first established in 2003. China’s participation in Khaan Quest 2015 is notably not being heavily publicized in the Chinese press. Xinhua ran a brief article noting that this was China’s first time sending troops to the exercise, and many other press outlets have been largely silent on the matter. Other major multinational exercises, including the Rim of the Pacific Exercise (RIMPAC), have drawn considerably more attention from the Chinese press. China has observed the exercise in the past. At last year’s Khaan Quest exercuse, which was included on the list of military-to-military exchanges in 2014 between the United States and China in the U.S. Department of Defense’s most recent annual report on China’s military, China was one of 23 participating states but did not send PLA forces to participate in the drills. “This exercise is an event which truly contributes to the enhancement of peace keeping and peace support capacities of armed forces of different nations,” noted Tserendash Tsolmon, the Mongolian defense minister. 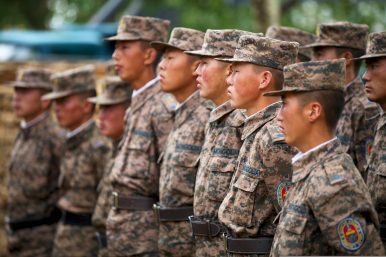 U.S. Marine Brigadier General Christopher J. Mahoney noted that Khaan Quest 2015 will help participating militaries “create professional military-to-military relationships” and “build personal and lasting connections.” No statements from either the Mongolian or the U.S. side emphasized the significance of China’s first-time participation. Khaan Quest 2015 will take place over the next two weeks in Mongolia’s Five Hills training area, located near the Mongolian capital of Ulaanbaatar.